wordplay. Highlights of "Noir" include the lead single "We Do Our Thing" that has Willie The Kid, MaLLy, P. Blackk and Fabrashay trade rhymes over an atmospheric instrumental backdrop as well as Chuuwee's "Rock The Party (Bang Bang)". On this standout track the Sacramento rhymesayer and long time JR&PH7 collaborator rocks your local house party over a hard hard knocking drum break that will leave you with neck problems. 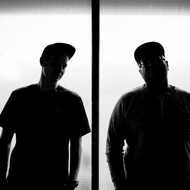 JR & PH7 - ''Noir'' from Below System Records on Vimeo.